This paper explores the link between trade structure, trade specialization and per capita income growth. It is argued that industrial upgrading in export specialization patterns has a positive long-run growth effect, while the effect of structural change in industrial import patterns is in principle ambiguous. A standard empirical growth model is augmented by various measures of structural change. The hypothesis that not trade per se matters, but that various types of trading activities impact differently on economic growth is tested on a sample of 45 countries (OECD members and selected Asian and Latin American countries) over the period 1981-1997. The data set comprises exports and imports for 35 manufacturing industries at the 3-digit level of the ISIC classification which are grouped according to skill intensity. The results of the dynamic panel estimation point towards a positive long-run growth effect arising from trade specialization in medium-high-skill-intensive industries. 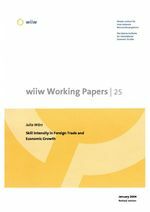 Further, important distinctions between the skill intensity of export and import patterns and their respective influence on economic development, as well as between the group of developing countries and OECD members are observed in this relationship.